A solid ride by Honda Racing’s Dan Linfoot in this afternoon’s first MCE British Superbike Championship race at Oulton Park has pushed him a step closer to securing a place in the Showdown. Starting the 18-lap race from ninth place on the grid Linfoot, 27, pushed hard to get his Honda CBR1000RR Fireblade up with the leading group. A good few laps saw Linfoot up into fourth place, but a charging Josh Brookes pushed him back to fifth where he crossed the line. 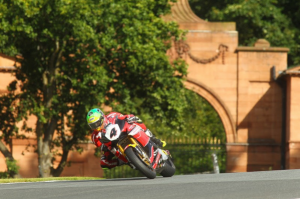 Linfoot now has 116 points and is just 17 points outside the Showdown behind Michael Laverty in sixth place. The Knaresborough rider will start tomorrow’s second Superbike race from the second row of the grid in sixth position. Meanwhile Julien Da Costa, who’s standing in for injured Jason O’Halloran, had a good race on his CBR machine finishing inside the top-20 in 16th place. The team’s third rider Jenny Tinmouth had another positive race, breaking her own personal lap record at her home circuit and came home in 20th position. The Honda Racing team will now prepare all three CBR machines for another action packed day tomorrow (Sunday 6 September) with two 18-lap races. For all the latest news and information on the team follow @HondaRacingBSB or check out the team’s Facebook page. Well we finished fifth today, which is where I needed to be in terms of grabbing some points over my rivals to try and get into the top-six, but in one hand I am a little disappointed as I felt like I had a better pace over the race distance. But, the good thing is that we collected some more points and we have a much higher starting position on the grid for race two tomorrow, so hopefully that should put me in the right mix to grab a higher finish. I always enjoy a long race like that and am looking forward to tomorrow’s two races to hopefully finish in the mix and get a place in that Showdown! Race one was really good, I managed a good start off the line and made up some places, but lost them again coming into the third and fourth corners. I tucked in behind Aaron [Zanotti] and managed to get back past him, then started to chase John [Ingram] but couldn’t quite close the gap. It was a good race and I managed to break my personal best at my home circuit, so have something to build on for tomorrow and can’t wait to get back out on the CBR for tomorrow’s two races. Well I knew it was going to be difficult, but that was really difficult! It’s another discipline for me and I’ve come from an Endurance World Championship test at Paul Ricard, which is a long and fast circuit to arrive at Oulton Park, which has many bumps and slow corners. So I have to adjust my riding style quite a bit to suit the CBR here. But, it’s great fun and I am enjoying being back in BSB and looking forward to the two races tomorrow.